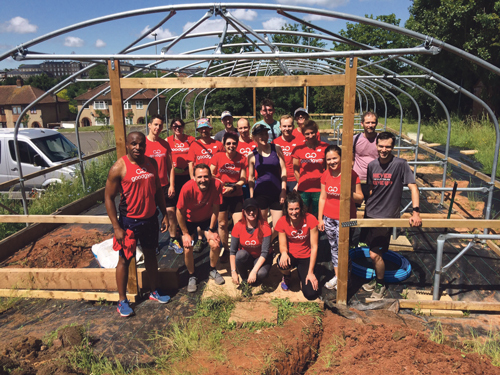 Bristol GoodGym visited the allotment at Fairfield High School (FHS) to help dig a trench to pipe water into the polytunnel. Around 20 volunteers ran to the school, dug the trench then ran home! The group threw themselves into including digging a 60cm deep x 60m long trench for a water pipe, fencing around the allotment area, constructing of raised beds from sleepers and filling them in, amongst others. Scott Mears, Nature Club Co-ordinator and Science Teacher at FHS comments: “We were lucky to receive Lottery funding to buy a polytunnel and set-up a community garden on the school grounds a few years ago. “Since then we’ve been working tirelessly with volunteers to get the infrastructure up and going. It’s been a slow process, as the money spent has been on materials, meaning nothing left for physically doing the work.